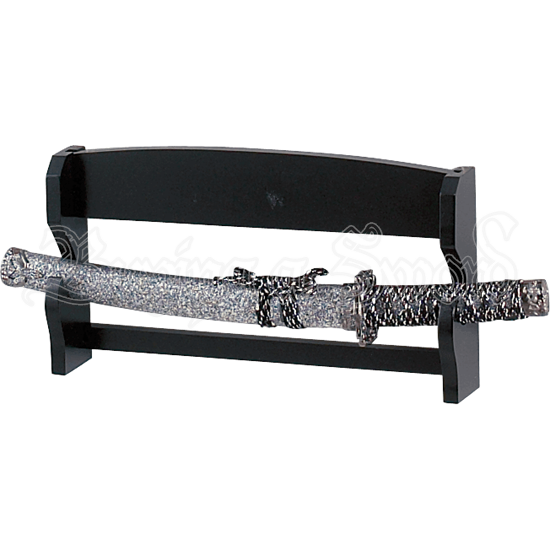 Short, sweet, and to the point, this Single Sword Wall Mounted Rack is the perfect way to pick your favorite sword off the ground and transform it into a decoration worthy of display, all by setting it higher up on your wall, for all to see and enjoy. Possessed if an iconic and classic design, this sword rack is made entirely from hardwood that features a handsome black lacquered finish. It features a duo of supports that provide plenty of stability, while its single tier design allows for the display if a single sword of almost any type. It is sized to fit katana and wakizashi with ease, and it even looks good with axes and more traditional European weapons, too. Heck, if you have a large collection, you can even mount this Single Sword Wall Mounted Rack and then start changing your weapons out every few days, just to create a rotating display that changes the style of your room or office as often as you like!